We are a family of four, and three out of the four of us have become kombucha addicts. It’s supposed to be good for you–good for your gut, that is, which means good for your whole body. However, several months into this addiction, I saw a big jump in my grocery bills as a result. At roughly $4 a pop, those 8 oz bottles were beginning to take a larger than acceptable portion of our whole paycheck. I know lots of people make their own kombucha, so I figured I’d join the movement. However, just about that time, I drank a larger-than-average-sized bottle (12 oz) of kombucha, and got a very upset tummy. My tummy wasn’t just a little gurgly, it was downright knotted up and in pain! (And as luck would have it, this happened the same day one of my dearest friends flew in from NYC, and we had a reservation at one of my favorite wine country eateries– Farmstead at Long Meadow Ranch.) Had I been the only one to drink a “bad” bottle kombucha, I would have shrugged it off. But as things stand, I know several people who have experienced a very rough day (and night!) or two due to a bottle gone bad. So that was the end of my relationship with kombucha…. Well, sort of. I was determined to find a probiotic drink, and I’m not a fan of regular probiotic drinks, such as kefir, since they’re made with dairy and incredibly high in calories. I ordered my water kefir grains from Cultures for Health, the same company from which I got my yogurt starter. Through CFH, you’ll initially spend $16.99 for the grains plus shipping, but then settle in to a joyous period of spending just pennies for quart after quart of water kefir. Once activated, the grains can be used indefinitely! 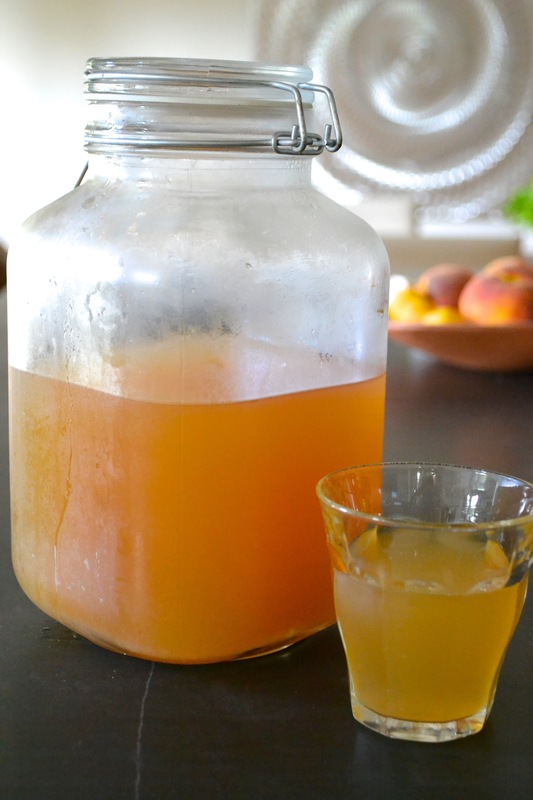 It takes me 5 minutes–read: 5 minutes–to prep two quarts of water kefir, after which, you let the grains work their magic for 48-72 hours. Then voila! You have a lightly-carbonated, refreshing drink that’s delicious as is or flavored any number of ways. (I added fresh-squeezed lemon juice to the first few batches, which made the water kefir taste just like an Arnold Palmer, but now I love it best just plain.) Two quarts lasts us several days, which is how long I ferment my water kefir, so I always have one glass jar in fermentation, and one in the fridge for drinking. But was it too early to start rejoicing? During a recent excursion to Whole Foods, I happened to overhear an employee lamenting the high sugar content–28 grams(!! ), of a particular brand of kombucha (which I won’t name here because if you’re a kombucha drinker and you’re reading this post, I’m betting you’ll take 10 seconds to look at the “nutrition label” next time you reach for a bottle). Due to my nature, I panicked and contacted CFH the second I got home, asking the sugar content of water kefir. They cautioned that this is a very rough estimate with many variables. However, considering I let mine ferment for three days, I can safely assume there is less than 2 grams of sugar per 8 oz. Whew! 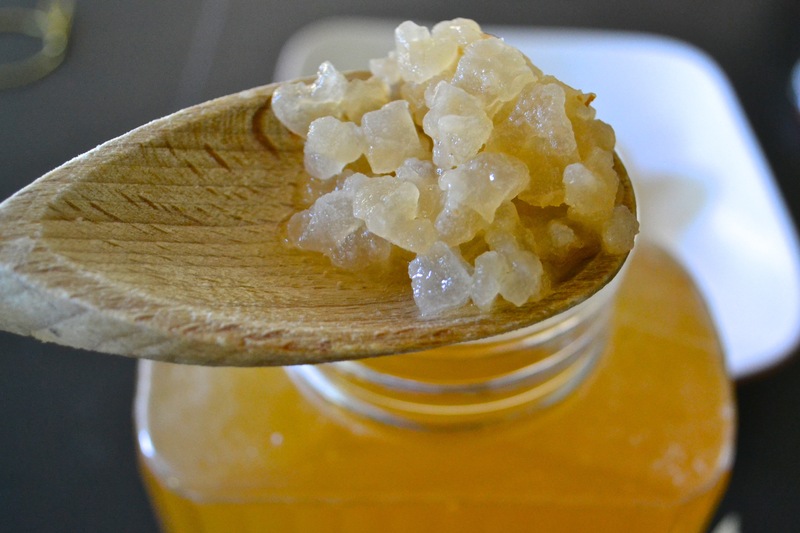 In case you decide to make your own–I really can’t stress how easy and incredibly economical it is, you might like to know that I use 1/4 cup evaporated cane juice crystals and 1/4 cup sucanat per 2 quarts of water.